We’ve had a long love affair with Zuke’s treats. We can honestly say “we knew them before they were famous”. It all started around 10 years ago. I was working at REI and Chester was my sole furry hiking buddy. 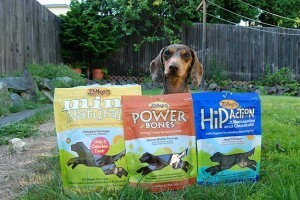 I picked up a bag of “power bars for dogs” – Zuke’s Power Bones. Chester loved them and they have been our favorite go-to treat since then. Over the years Zuke’s has expanded and so has our loyalty to them. As they have added products to their lineup, we have tried them all. Some of them have been added to our favorites list. In the past I have shared with you why we think Zuke’s in the sh*t. We were one of the first to try the Wild Rabbit flavor of Mini Naturals. When we are traveling, we skip taking our messy liquid glucosamine supplement in favor of their yummy joint treats. Today we have some doubly exciting news. First, we are super excited to announce that we have accepted our first long-term sponsorship. Long-term sponsorships allow us to champion our favorite products as brand ambassadors while fueling our adventures. The second bit of exciting news is that…you guessed it….Zuke’s Performance Pet Nutrition is our first long-term sponsor! We look forward to helping you get to know Zuke’s better. They are adding a new dog treat to their lineup that we will be sharing with you soon. We’ll be telling you about all of the cool stuff they do to promote healthy, active dogs. As always, we will be sharing our adventures with you that Zuke’s helped make possible. You can make friends with Zuke’s Performance Nutrition yourself on Facebook or Twitter. What we want to know is have you tried Zuke’s? If you have, which treats and what did you think of them? We recently started using Zuke’s for learning how to shape with a clicker. We use the minis because they are little and can be quickly eaten. So far we have tried the chicken and now have the peanut butter. Teach has seemed to really like both. Congrats on your long term sponorship!! Very awesome! 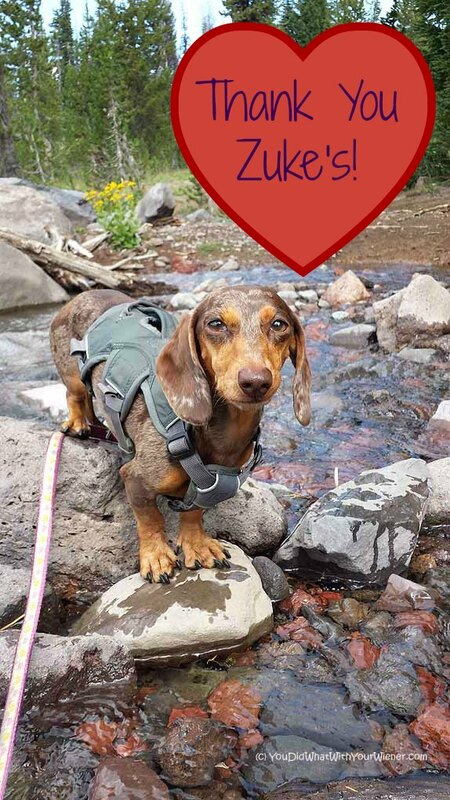 You are such lucky dogs (and persons) over there to get Zuke’s as a sponsor!!! They are my FAVORITEST treats…EVER! ALL of them! I especially love the Supers because they are a great extra boost for dogs on raw diets (like me) and they are perfect size (and TASTE) for training. *high paws* to all of you!! Congratulations! We have tried the Supers but not eaten them much. If you break them in half they are about the same size (and probably about the same calories) as the Minis. Great point about the added vitamins for dogs on raw diets. I have switched Chester and Gretel to whole-prey raw (no fruits and veggies but some extracts for vitamins). I still worry that they aren’t getting enough though so the Supers sound like they might be a good boost. We recently started using Zuke’s Minis for Bella’s training. She had turned her nose up at them in the past but I guess I just didn’t get the right flavor for her. She really likes the roasted chicken ones though and I like them because they’re small enough to use for training and not sticky or slimy. We use them for training too. Chester and Gretel liked all the flavors but I do know some dogs that are more discerning. Luckily, there are several different flavor choices. The fresher and softer they are, the more they are universally liked too. I had a run in with Zuke’s customer service that left a bad taste in my mouth. Blah. They seem to make a nice product, but allergy dogs BEWARE. On, no! That is too bad. Honestly, I have never had an experience with their customer service department. I would be interested to hear more about your experience. We are HUGE fans of Zuke’s here! Congratulations! The rabbit minis are a big hit here, but I hate that they’re more expensive than the other flavors, so we don’t get them too often. I can’t remember anything by Zuke’s that our dogs haven’t loved, though! Congratulations! Rita LOVES Zukes!! We especially love the minis. She has 2 minis every night before bed, and they are great for training treats. Her favorite though is the venison jerky. Oh man, does she love that stuff! How awesome for you! We never really had Zukes, but now with my little sister in constant training, we have Zukes Mini Naturals around the house and we just love them to death. Of course, wabbit is my fav, but we like the chicken, and peanut butter too. They are easy to tote around, not smelly, small sized, low cal and we do anything to get one. We are officially hooked on them! Congratulations on the sponsorship! We love Zukes at our house too!! So exciting! I only tried Zuke’s once with Lucky – I haven’t tried them yet with Kayo. I was just on Kimberly’s blog talking about how I’m about to start giving Kayo supplements since she puts so much stress on her body. Maybe Zuke’s will be our first stop! That’s great! I think sponsoring something you truly believe in is just great. I look forward to hearing your long love affair with Zukes. That’s awesome! We loved Zuke’s even before the interwebs began! haha! Seriously, I’ve loved them for years for training my small pups. Congratulations!